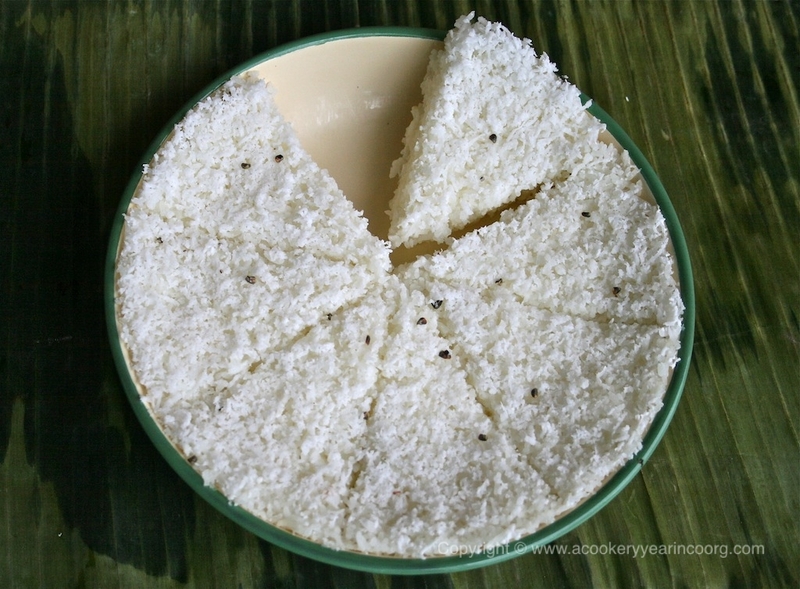 Broken rice cakes cooked with milk and coconut. You will need small thalis with raised rims, or dhokla plates. Do try and find some plates with reasonable depth – paputtu is best in thick slices. A sekala, idli steamer or a pressure cooker wide enough to accommodate the plates you are using. If using the latter, steam without the weight on. A bamboo steamer will work too, but you may need to increase the cooking time by 10 to 15 minutes. Flat wooden sticks to separate the plates when stacking in the sekala. Improvise with anything that provides a stable base for the plates to rest on and that doesn’t restrict the flow of steam. Wash the thari and soak for 1/2 an hour in the 2 cups of water. Add the grated coconut, milk, cardamom, sugar and salt and mix well, squeezing the coconut to extract a little milk. Divide equally between plates and steam for 25-30 minutes or until done. The puttu should look firm, with no soggy bits in the centre. Cover the plates with a clean tea cloth and allow the puttu to cool a little before cutting into pieces. Best eaten with a simple mutton or chicken curry. Or, make a sweet breakfast of it with fresh butter and honey. This recipe makes three plates of paputtu. The plates I use hold 500ml each. Do not fill the plates more than two-thirds full to allow room for the thari to expand. Increase the sugar to taste for a sweeter cake that can be eaten on its own, or with a little ghee or melted butter. Replace the milk with light coconut milk for more coconut flavour.This version is good with a spicier curry. Powdered coconut milk works nicely if fresh is unavailable.